George Bentham 1842 London Journal of Botany, 1: 504–505, as Acacia rigidula. David S. Seigler & John E. Ebinger 2006 Phytologia, 87: 166, as Vachellia rigidula. This is still most often listed in databases and indexing services as Acacia rigidula. Britton & Rose 1928 North American Flora, 23 (2): 94, described this as Acaciopsis rigidula. 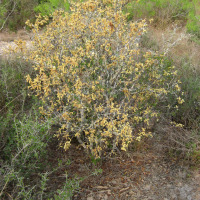 Acaciopsis means that it looks like an Acacia. rigidula is in reference to something being rigid. Bentham probably was referring to the branches. 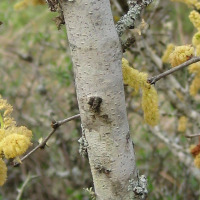 Both the spines and the branches are rigid. 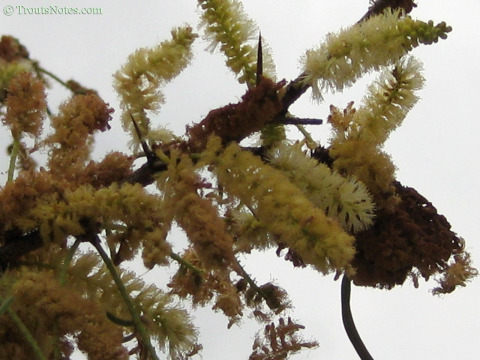 amentacea means “in the form of a catkin” in reference to the flower spikes. according to Stearn (catkin = Amentum). 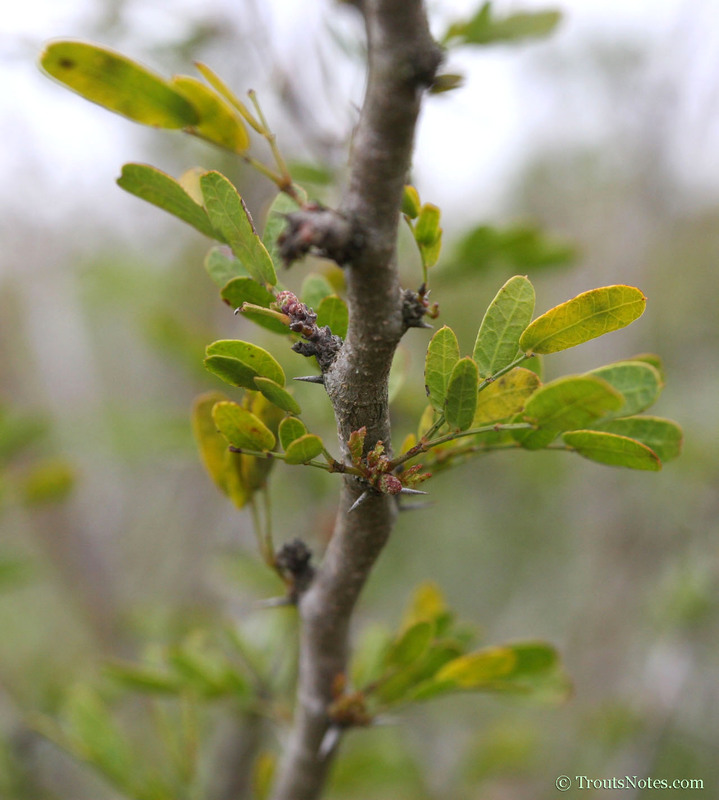 Acacia rigidula in Jim Hogg County illustrating why it is called black-brush. 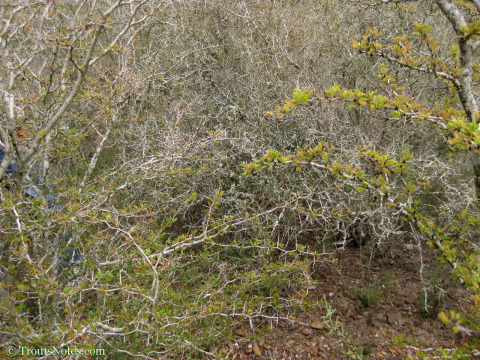 “Black bush” can also be found listed but should be suspected to be the result of a typo. Britton & Rose 1928 give as “Southern Texas to Tamaulipas, Nuevo León and San Luís Potosí.” Powell 1998 notes as occurring in northern Mexico to SLP and Tamaulipas, to be abundant in the Rio Grande Plains and through South Texas, also to be common in Val Verde County (1100–1800 ft), occurring in Terrell County, and also more rarely farther West in Brewster County close to the Rio Grande. UTEP: “South Texas and adjacent Tamaulipas, northwest along the plains of the Rio Grande corridor into southeastern Trans-Pecos and south through Coahuila, Nuevo León to San Luis Potosí and Veracruz“. Dry soils including rocky limestone, calcareous gravelly-loam, loamy, sandy and clay soils. 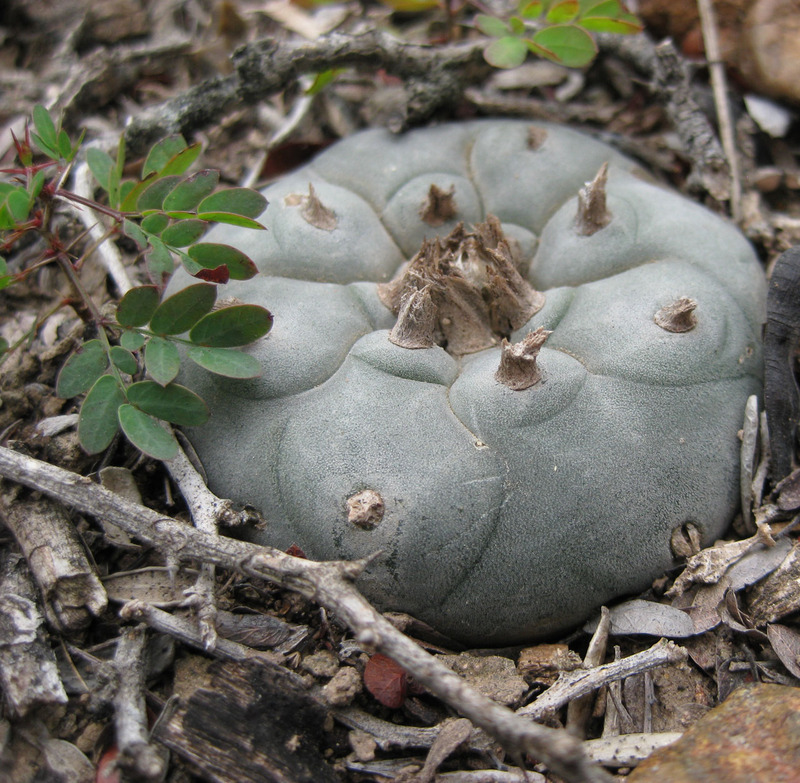 Often found on limestone caliche ridges, slopes, hillsides and canyons. 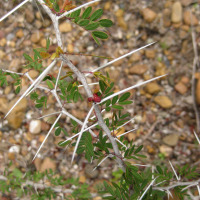 It is a common component of the thorny brush-country of South Texas. Powell 1998, TAMU, UTEP. Perennial deciduous thicket-forming shrub or small tree, 3–4.5 meters high (UTEP gives as 3′ to 15′ H by 3′ to 12′ W), many long branches arising from a central trunk. 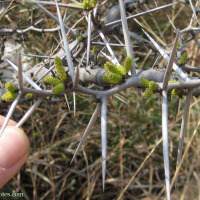 Branches are stiff, commonly zigzagging, with pairs of short, straight and very sharp spines, 0.5-2.8 cm long, sometimes growing up to 5 cm. long. The spines are placed at the base of each petiole (stipular). Fruit is a narrow, curved, flat legume 6–8 cm. long (up to 3-1/8″ long according to Richardson & King 2011), 3-4mm wide. Fruit is 2-valved, with divisions between seeds, readily dehiscent, the valves separating into 2 layers, and covered with minute hairs (puberulent). Black, brown or reddish. Seeds are oblong, lenticular, their axis parallel with the legume, the funiculus is long. Reddish-brown when ripe. Adapted from Britton & Rose 1928, Isely 1969, Richardson & King 2011, Stanley 1922, TAMU & UTEP. (Feb.) March, April, May & June. 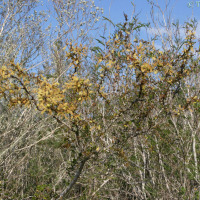 Beginning in Spring before leaves have fully appeared. Isely 1969, Wildflower Center & UTEP. 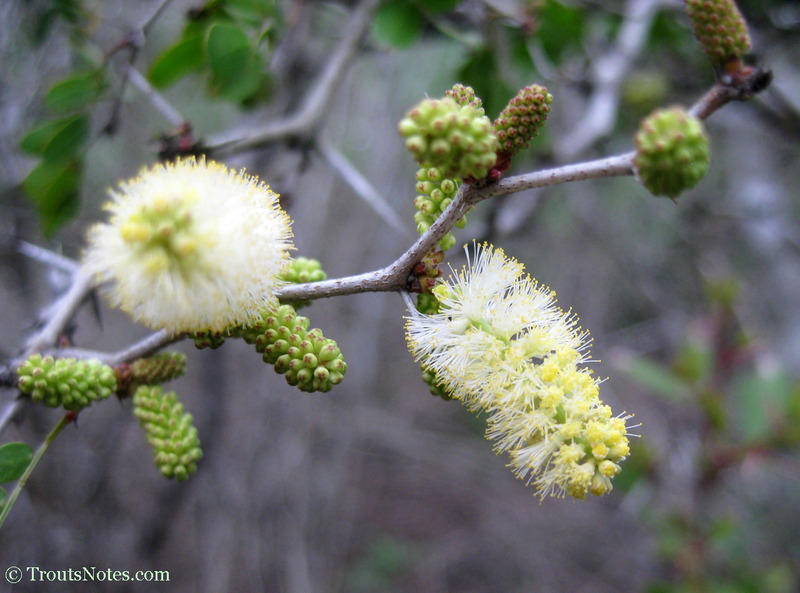 March-April and following rains is a common pattern. Late summer through early fall when fully ripe. Wildflower Center. 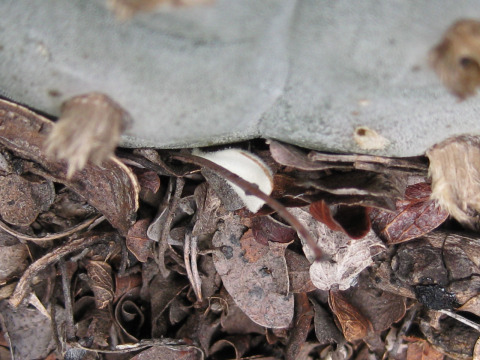 A seed photo is at the USDA website. 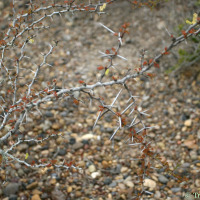 Said to be hardy to 20°F (UTEP). It is clear that they survive colder temperatures in the wild. 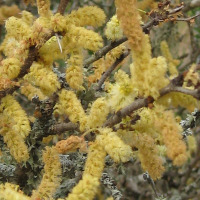 Ornamental shrub, thorny barrier hedging, erosion control and renown as a superior honey source. 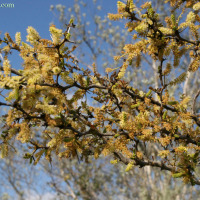 “This tree provides fair grazing for wildlife and poor grazing for livestock“, UTEP. 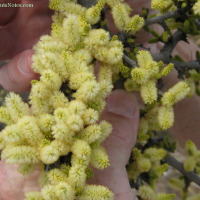 Fairly slow growing, responds well to pruning, does best with partial shade. 2) Published analysis by Clement was suggested to be non-reproducible by Pawar et al. 2014. Comments by Shulgin are also noteworthy. Britton, Nathaniel Lord & Joseph Nelson Rose (1928) North American Flora, 23 (2): 1–194. 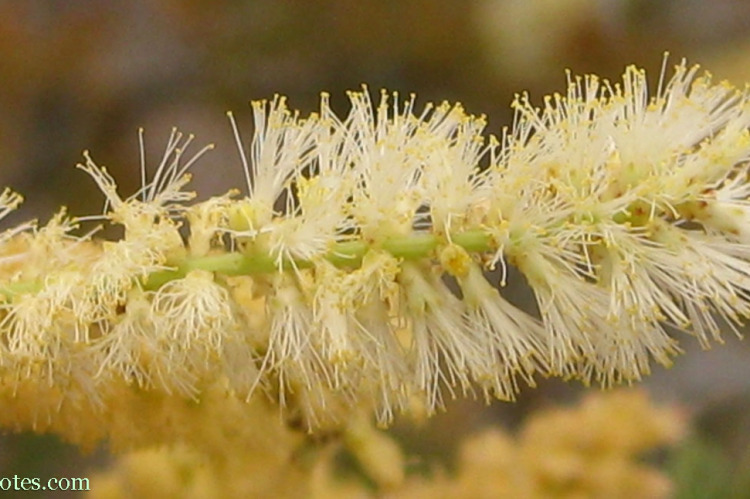 “Mimosaceae”. Correll, Donovan Stewart & Marshall Conring Johnston (1970) Manual of the Vascular Plants of Texas. 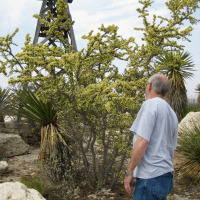 Powell, A. Michael (1998) Trees and Shrubs of the Trans-Pecos. Stanley, Paul C. (1922) Trees & shrubs of Mexico, page 376. Stearn, William (2004) Botanical Latin. 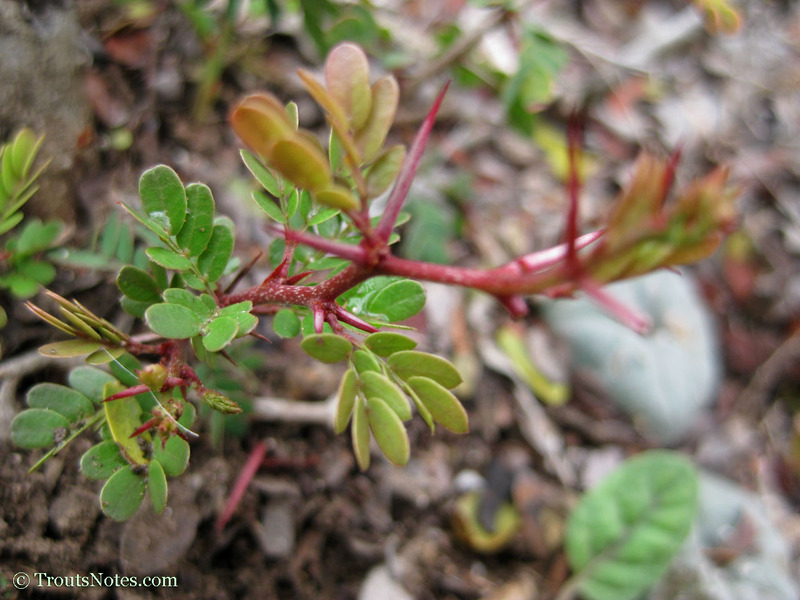 Note A: USDA gives Acacia amentacea DC as a synonym based on that opinion appearing in Stanley 1922. 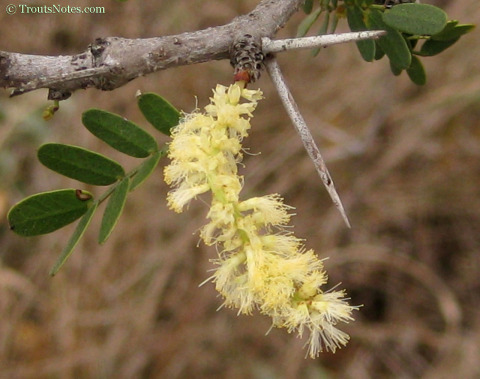 For that reason and the accepted rules of priority, prior to the creation of Vachellia rigidula it was not uncommon to find Acacia rigidula being absorbed into Acacia amentacea. This is a result of the perennial ebb and flow between the viewpoints of lumpers and splitters. 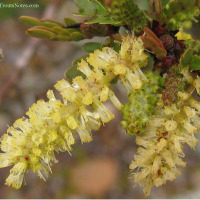 They were distinguished by Correll & Johnson 1970 who believed that “true” Acacia amentacea was limited in distribution to southwestern Mexico. 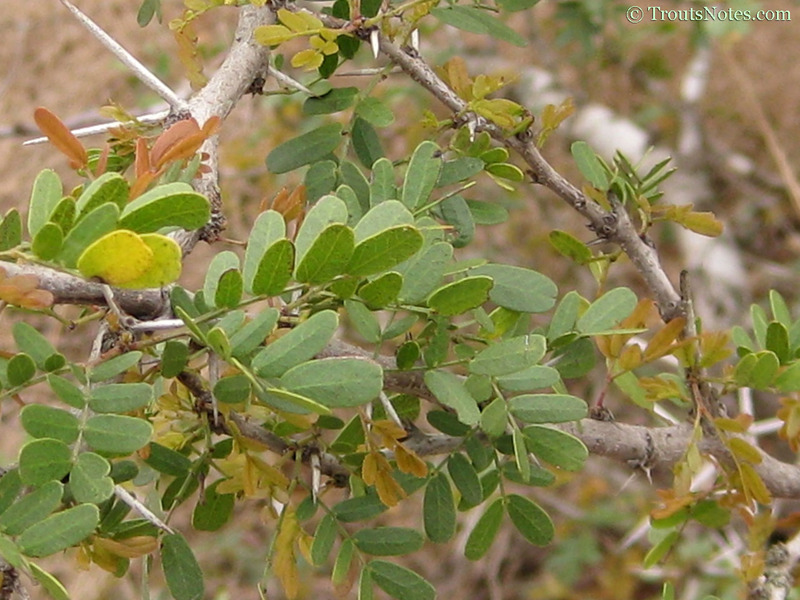 Isely 1969 considered the Mexican Acacia amentacea to be “almost identical except for fewer leaflets“. Britton & Rose 1928 listed a number of relatively small differences: straight spines on rigidula versus acicular (needle-shaped) spines on amentacea, a longer maximum length of spines for rigidula (up to 5 cm compared to 1-2.5 cm for amentacea), fewer leaflets on amentaceae (2 pairs compared to 3-6 on rigidula – although it should also be noted that TAMU gives 1-8 for rigidula), the rachis on amentacea is said to be grooved and somewhat pilose as opposed to glabrous on rigidula, with leaflets 10-20 mm long on amentacea compared to 6-15 on rigidula. 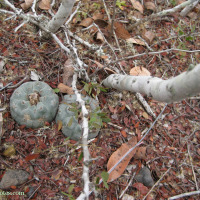 Note B: “chapparo” is a Spanish word used for several trees. The Spanish word “prieto”, referring to a “dark-skinned person”, is increasingly falling into disuse in databases, perhaps as it is also commonly used as a derogatory term.